The long ash plume from Bezymianny seen stretching across the Pacific Ocean on March 17, 2019 by Terra’s MODIS imager. The smaller plume from Sheveluch can be seen just above the darker Bezymianny plume. NASA. The Kamchatka Peninsula in far eastern Russia is one of the most active volcanic areas on Earth. It isn’t surprising to find multiple volcanoes erupting each week and this week is no exception. Two side-by-side volcanoes — Bezymianny and Sheveluch — were simultaneously erupting over the weekend (above). The eruption at Bezymianny was big enough to cause some air travel over the peninsula to change their flight paths to avoid the ash, but that’s business-as-usual in Kamchatka. Kamchakta is remote and fairly sparsely populated. Only about 1600 people live within 30 kilometers of Sheveluch and only 47 within 30 kilometers of Bezymianny. 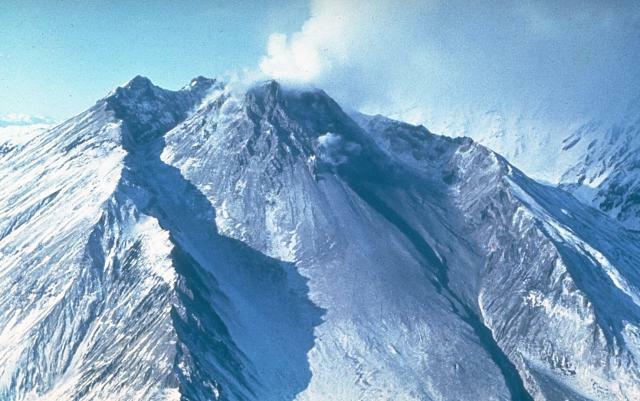 The monitoring of the volcanoes in Kamchatka is done by KVERT (Kamchatka Volcanic Eruption Response Team) with help from the Alaska Volcano Observatory. The low hazard for people on the ground is balanced by higher hazard for people in aircraft that traverse the airspace over and near the peninsula. Most of this traffic is from the Americas and Europe to eastern Asia, so someone flying from Seattle to Hong Kong might be in the path of an erupting volcano even if their destinations are thousands of kilometers from the action. Ash is very bad for jet aircraft, so avoiding ash plumes is vital, which means the Volcanic Ash Advisory Centers have to use satellite data and ground observations to warn airlines and air traffic controllers about potential ash plumes. That makes Kamchatka a real problem. Not only are the volcanoes remote and challenging to monitor, but they also tend towards explosive eruptions. Case in point the eruption of Bezymianny on March 16. That blast sent ash to 15 kilometers (50,000 feet), well above where commercial air traffic flies. The ash drifted east over the Pacific Ocean and ended up causing flights in the Aleutians as far east as Unalaska (2000 kilometers away!) to be cancelled. Trans-Pacific flights had to follow some different routes as well to avoid the ash. Although Kamchatka doesn’t have a lot of people to watch the volcanoes erupt, KVERT does operate a bunch of webcams to watch the eruptions. Bezymianny has three pointed at the volcano as does Sheveluch. This means you can see some of their giant explosions while sitting across the globe. Even at night you can spot activity, like a glowing lava dome on Sheveluch (below). Both the eruption at Bezymianny and Shiveluch are caused by lava domes forming and then getting destroyed as the pressure building underneath the dome gets to high, causing the dome to “pop” like a cork (if the cork also shattered into tiny pieces). The sticky lava erupted at these volcanoes leads to these explosive eruptions. There aren’t many truly “remote” places on Earth these days, so volcanoes in areas where people are rare can still be a big hazard. 100 years ago, we might not have even known eruptions like these at Bezymianny and Sheveluch were even happening unless someone happened to be nearby or notice ash falling on their town. Thanks to all the satellites watching the planet, we now know a lot more about how volcanically active the Earth is.